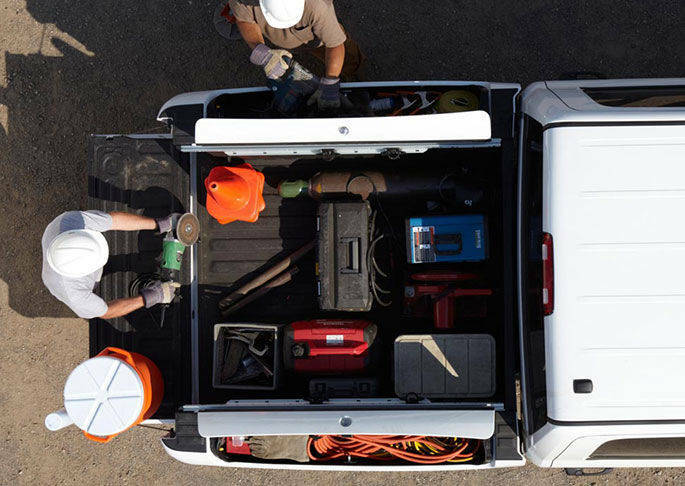 A new patent filing by Fiat Chrysler USA may point to Ram trucks getting retractable ramps for the truck bed. Allpar, being the ever vigilant Chrysler watchers they are, caught a hit today when they came across a patent filling. The patent is for “ramps that slides into the bed and tailgate for storage.” If what the patent drawings are showing is true, then Ram owners will possibly be getting an easier way to get heavy objects in and out of their truck beds. The drawing shows a very simple concept, to have retractable ramps that sit right below the surface of the truck bed and can then be brought out. I do not doubt that Ram would love to have this be standard issue on all their trucks. One look at it and it is easy to see the accessibility it provides and how much of a boon it would be to truck owners who need to get something heavy loaded quickly. While it is an easy thing to make on paper, retractable ramps like this may not be as easily produced. It is certainly an idea that Ram has had in the past, as Allpar states, but the problem seems to be in being able to make the ramps durable enough to do their job. This is something that either Ram has overcome and they are staking their claim on it, or they just want to have it available to them to use in the future. Here’s hoping that they have something in place and ready to go. This entry was posted in Queens Bayside Chrysler Jeep Dodge, Ram, Ram 1500, Ram 2500, Ram 3500, Ram Cargo Van, Ram Chassis Cab, Ram News and tagged Allpar, Bayside Chrysler Jeep Dodge, Chrysler, heavy loads, patent, Ram, ramps, retractable, trucks by baysideadmin. Bookmark the permalink.